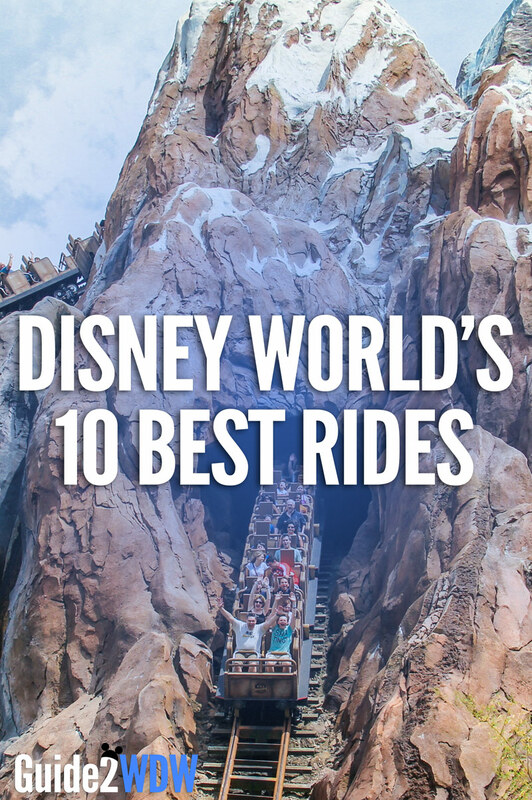 Almost more than anything else, Walt Disney World is known for its rides. From the charming dark rides to the thrilling roller coasters, most guests at Disney World will fill up their day at the parks by going on rides. There are 46 rides at WDW, many of which have become famous enough to garner their own dedicated fan bases. So, narrowing this list down to just 10 rides has been a bit of a challenge. I had to even leave off rides that I love and go on every single time I’m in Orlando, like Space Mountain. For this list, I tried to keep a few things in mind: theming, thrill-factor, charm, upkeep, repeatability, and uniqueness of the experience. Also, to qualify, the attraction must have a moving vehicle, so no shows or meet and greets will be found here. A great Disney ride is as much about the experience as the actual physical movements of the ride. Kilimanjaro Safari provides a great experience that can be entertaining, educational, and breathtaking. Riding by exotic African animals as they interact with each other, sometimes just yards away from your vehicle, is an Animal Kingdom experience that really should not be missed. It also helps that no two safaris are alike, so I always feel engaged every single time I go back on Kilimanjaro Safaris. The addition of a nighttime version of this ride should make it even more re-rideable. A definite must-ride every time you visit the Animal Kingdom. Epcot’s iconic attraction takes guests through the history of human communication, and the scope of this ride appropriately matches the subject matter. From the painstakingly detailed scenes to the massive geodesic sphere housing the ride, Spaceship Earth is a complete wonder. While some may have preferred the Jeremy Irons or Walter Cronkite versions, I still truly adore this ride. Grandiose, sweeping, and optimistic, Spaceship Earth is an amazing accomplishment that truly embodies the spirit of Epcot. I still haven’t experienced anything quite like Soarin’ at any other theme park (outside of California Adventure, of course). The giant screen and the moving seats provide a gentle feeling of flying, and special effects like the wind of the Pacific Ocean and the smell of the orange groves in Camarillo create a great sense of immersion. The gentle thrill has proven to be a great draw for guests of all ages, as Soarin’ has some of the longest lines at Disney World. I’m really looking forward to Soarin’ Around the World when it debuts this summer with an international ride film and new 4K digital projection system. Also, any ride that features Patrick Warburton deserves a spot on this list, which will be hereafter be known as the Patrick Warburton rule. While Buzz Lightyear’s Space Ranger Spin first brought gameplay into a major theme park ride, Toy Story Midway Mania upped the ante by combining fun gameplay, bright 3D visuals, and frenetic movement. It’s really a video game that you can ride through, starring some of Pixar’s most memorable characters. What makes this ride great is the fact that the Midway games are extremely fun, and they even have hidden targets for expert players to unlock. While this might be the ride with the biggest element of fun at Disney World, I really wish there was a bit more to the sets in between the screens. While it doesn’t ruin the attraction, a more immersive sense of place would help put this ride over the top. You’ll want to look down. Not when you enter the Hollywood Tower Hotel. You’ll want to look around and soak in the sights of the 1930s era hotel. Not when you enter the pre-show, as the quintessential creepiness of everything might make you want to be on your toes. Not when you board the elevator, you’ll want to listen to the bellhop. Once again: creepy. Not when you start your ascent, as there’s not much to see. Oh, except for that ghost family. For a third time: creepy. It’s when you reach the top of the almost 200 foot tower, and the doors open and you get a view of all of Disney’s Hollywood Studios. You’ll want to look down then. As you’re about to free fall for a random number of times, you’ll want to take in the sights while you can. Like It’s a Small World, Splash Mountain is one of those Disney World rides that has a high chance of getting a song stuck in your head. Unlike It’s a Small World, you probably won’t mind humming the tunes of Splash Mountain days or even weeks after taking a drop on this log flume ride. The catchy songs, lovable characters, and, yes, thrilling drops all combine to create an unmissable experience at Magic Kingdom. The combination of dark ride and thrill ride makes this attraction an everlasting classic. The only thing keeping Splash Mountain from being higher on the list is the hit-or-miss state of upkeep in the attraction. The last couple of times I went on Splash, a few of the effects weren’t working and a couple of the animatronics were motionless. Still, in its ideal state, this is the embodiment of everything a great Disney World ride can accomplish. It’s really appropriate that Seven Dwarfs Mine Train follows Splash Mountain on this list, as it’s the latest example of how brilliantly Imagineering can blend thrill ride and dark ride. Ok, the thrills are of the kid-friendly variety. And, yes, the dark ride is just one scene. And the ride may be a scotch too short. But, everything about Seven Dwarfs Mine Train while it happens is excellent. The coaster is the smoothest I’ve ever ridden, and the two drops are genuinely fun, even for teens and adults in the group. The dark ride scene is just stunning, with the best animatronics WDI has produced to date. 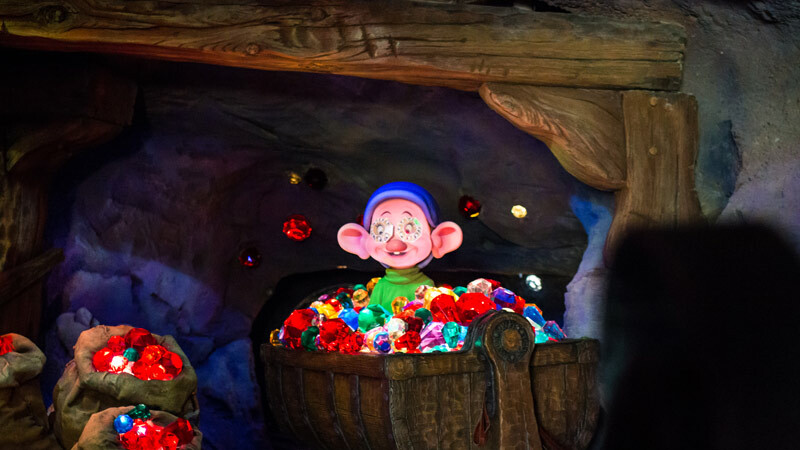 No matter how many times I go on Seven Dwarfs Mine Train, I find myself with a big dopey grin on my face. Whether you’re narrowly dodging an AT-AT on Hoth or speeding through the Death Star, Star Tours is bound to give you an unforgettable moment or two during your stay at Disney World. The recent addition of Jakku and BB-8 from Star Wars: The Force Awakens (including an incredibly cool cameo from one of its stars) shows the exciting possibility for this ride to continue to be updated as more Star Wars movies come out over the coming years. You’ll definitely want to ride it again to see how the adventures unfold next time. Expedition Everest shows Walt Disney Imagineering on top of their game. Expedition Everest is like the Matterhorn and Big Thunder Mountain Railroad had a child that is both faster and more thrilling than its parents. The trek up the mountain gives you the sense that you’re entering another world, and design of the Yeti is stunning. The constant technical issues that Disney has had with the Yeti prevent Expedition Everest from taking the top spot. This ride has a fun story, great ambiance, and a unique forward/backward mechanic that make it the best roller coaster at Walt Disney World. Welcome, foolish mortals, to Walt Disney World’s greatest ride. While it may not have the thrills or intensity of Expedition Everest or Tower or Terror, Haunted Mansion has pure atmosphere and amazing environmental storytelling. From the stretching room, to the ball room, to the Grim Grinning Ghosts finale, I’m not sure there’s a ride with more iconic and defining moments than The Haunted Mansion. The writing is memorable and chilling, from the beginning “When hinges creek in doorless chambers” to the final “Hurry back! Hurry back!” 45 years after it debuted at Disneyland, Haunted Mansion continues to be a pinnacle of themed entertainment and environmental storytelling. Do you agree? Disagree? Let me know in the comments below! What are the best rides for an 8 yr old (first timer) that HATES roller coasters and 3D? That’s a very good question! Here are my recommendations, park by park. If the eight year old likes thrill rides and just doesn’t like roller coasters, Splash Mountain and Tower of Terror might be worth trying. I remember both loving those rides and being scared of those rides when I was that age. Again, those might be a bit too intense for some guests. If there’s anything that you’re not sure about, try looking up a ride-through video on YouTube. It will give you a better idea if that ride is appropriate for them.